Making regular visits to the spa for a facial can be tough on your wallet. Even when you do have a chance to splurge on a spa treatment, the harsh chemicals that can be used by some spas might not leave you with the smooth skin and deep calm you had hoped for. 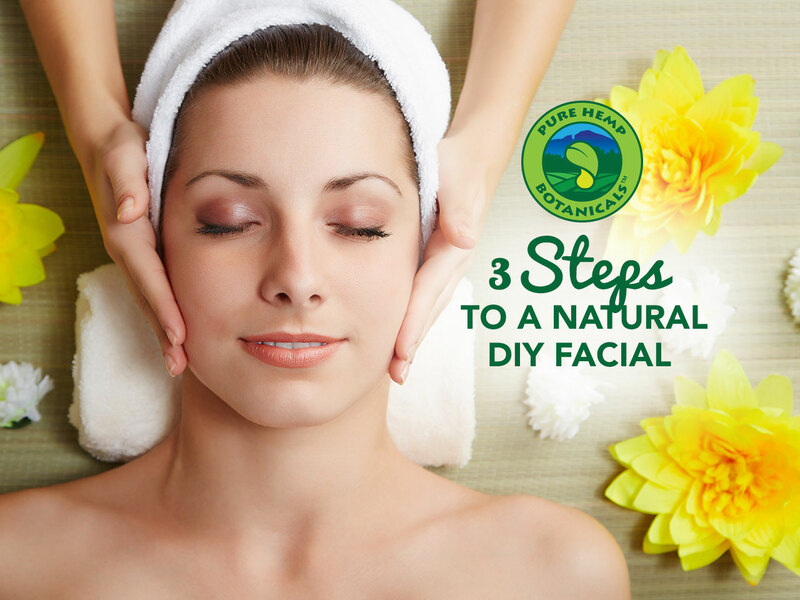 A great alternative is to pamper yourself with a natural DIY facial at home! The right natural ingredients can rejuvenate and clear up your skin while being gentler on your face. Even when you don’t have the time to give yourself a 20 minute facial or whip up a homemade moisturizing mask, you can pamper your skin by taking a little extra time during your daily skincare routine and using the right skincare products with natural therapeutic ingredients. While the labels on your skincare products may tell you to exfoliate after cleansing, Allure magazine learned from celebrity dermatologist Dr. Harold Lancer that it is best to exfoliate first. This makes perfect sense because, by clearing away the debris, pollution and dead skin on the surface with an exfoliant, your cleanser will be able to penetrate into your pores more deeply. After dampening your face, gently massage the exfoliant into your skin with your fingertips using upward, circular motions. Take your time. After about a minute, use a damp, warm washcloth to carefully wipe away the exfoliant. The exfoliant you use doesn’t need to be specific to your skin type but it is important to use a scrub that will soothe and moisturize your skin. Even though the purpose of a scrub is to remove dead skin and debris, you do not want one that will leave your skin dry or irritated. We recommend Nature’s Root Hemp Coffee Face Scrub. The rejuvenating scent of this scrub isn’t the only benefit. Both coffee beans and ground hemp seed help to brighten dull skin and reduce puffiness. Hemp seed oil is also a non-clogging agent that helps to reduce the number of blackheads and the size of pores. The combination of coconut oil and hempseed oil in this scrub has the added advantage of leaving your skin thoroughly moisturized. Most of us don’t take longer than 10 to 15 seconds to cleanse our face. Skincare professionals told SELF magazine that slowing down is one of the best ways to get the most out of your cleanser. SELF magazine recommends dampening your skin and then taking the time to massage the cleanser into your skin for one minute. Then, massage your skin by gently kneading it with your fingertips in those same upward, circular motions. After you have cleansed your whole face, especially along your hairline, rinse thoroughly and pat dry with a soft towel. The best cleanser to use is one that is geared toward your specific skin type and skincare needs, and there are many natural ones available on the market. The brand YesTo offers an excellent line of natural cleansers that range from the YestoTomatos cleanser for acne-prone skin to the YestoCucumber cleanser for sensitive skin. The last step is to deeply condition your skin with a moisturizer or serum. Instead of rubbing it into your skin, gently tap it onto your skin with your fingertips. If you are using a thicker moisturizer you may need to gently massage it into your skin. Be sure to use a light touch so you are not stretching your skin in the process. Much like with a cleanser, choose a moisturizer that is right for your skin type: oily, combination or dry. If you have oily skin, opt for an oil-free moisturizer. If you have dry skin, a richer moisturizer is a good option. Since we love how hempseed oil soothes and hydrates skin, check out The Hemp Seed’s English Daisy Facial Cream. We hope these tips help make your daily skincare routine more refreshing and effective! What are your tips for a natural DIY facial?